The bag looks perfect for a cruise. Have a fun day tomorrow with your friends. It will be perfect for her trip! Bonnie, these are just so georgeous, what a perfect graduation gift! I'd say Hillary is one LUCKY gal! great gift... i like the combo of handmade and money... i think with the money it is less want and more need... its hard these days! It is a beautiful bag. I am sure your nirce will be happy to get it, more happy than only getting money! 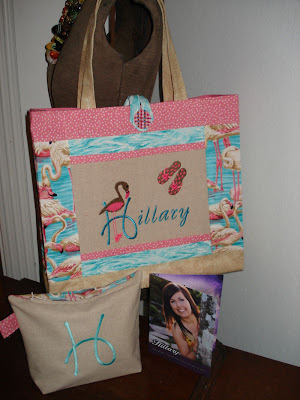 I can only imagine Hillary is going to love her very special handmade gifts! And yes, she is very cute. Adorable gift for an adorable daughter! Bonnie what an absolutely stunning bag, I don't think there will be any hesitation about whether she will like nit or not, she will LOVE IT. VERY nice GIFT!!! Love it!! I had my card swap tonight and made some lemon cupcakes..I'm in the mood for lemon treats!! How cool is that, Bonnie! I'm sure she'll love them. Isn't that the cutest gift? What a great idea! It will last longer than the money!! What a thoughtful gift! Bonnie, the bag is beautiful! I would have loved to get something like that for my graduation! Perfect gift for a cruise.